The production rate depends on the complexity of the forming application and can attain up to 1000 parts/hr. Fully automatic for high production volume. 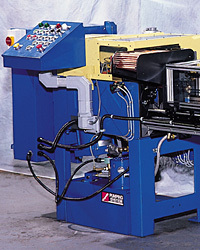 The fully automated machines are equipped with CNC user-friendly systems to control the entire process. Torrington Swager and Vaill is one of the world specialist of tube and bar forming with thousands of machines all around the world.